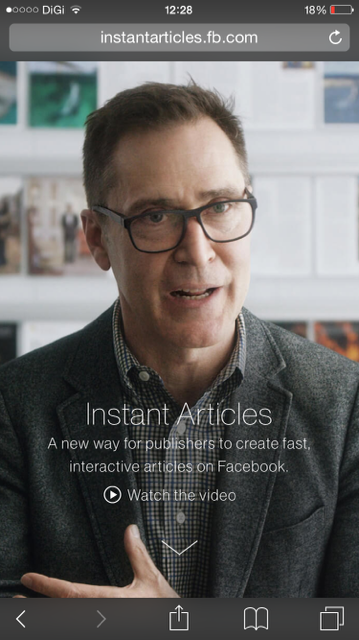 Last Wednesday, Facebook launched their Instant Articles feature where they ‘collaborated’ with several news organisations (The New York Times, National Geographic, Buzz Feed, NBC News, The Atlantic, The Guardian, BBC News, Spiegel Online and Bild) to publish their content on Facebook’s own platform. This means that when you click on a link/story by any of these news organisations on your FB timeline, you won’t be directed to their platforms. Instead, it you will remain on FB and everything loads faster (almost instantaneously) without any delay or buffering. And this includes audio, video and photos. As a consumer of content, it’s actually pretty cool. But for now, it only works on smartphones for the time being and not on desktops or laptops. However, FB is offering advertisements. The news organisations can choose to embed and sell advertisements themselves or allow FB to do it. They would receive full revenue for the first option, but shared for the second. Oh well… interesting times as always for content producers and consumers! !